The USGS acquired an airborne lidar survey of post-storm topography of Fire Island on November 5, 2012, to measure coastal change resulting from Hurricane Sandy. Comparisons of the post-storm elevation data to lidar data collected prior to Sandy's landfall are used to characterize the nature, magnitude, and spatial variability of hurricane-induced coastal changes, such as beach erosion, overwash deposition, and island breaching. 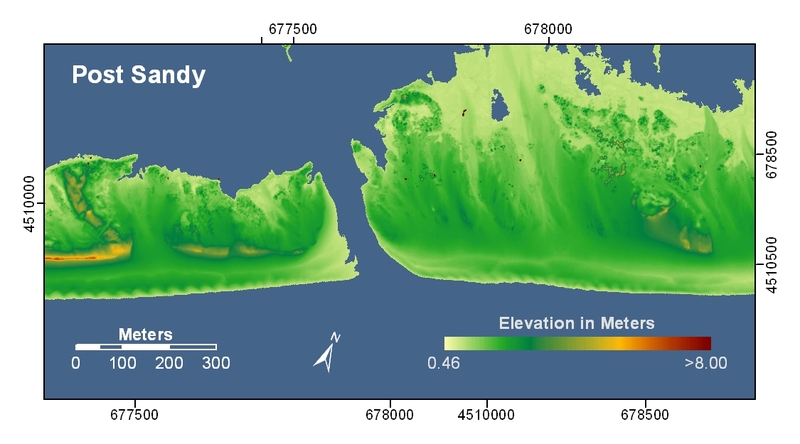 These measurements complement field-based observations of coastal change that were collected immediately prior to and three days after landfall. Location index for pre-storm and post-storm lidar elevations on Fire Island, NY. 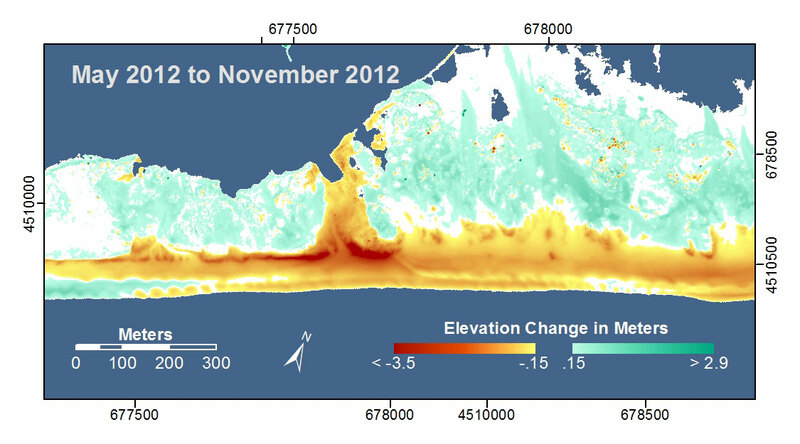 Each highlighted location includes pre- and post-storm topography as well as topographic change. 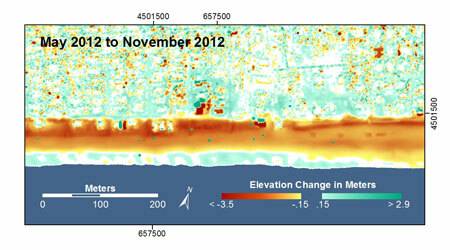 The green line shows Hurricane Sandy's track. Red patches indicate locations included in the post-storm airborne lidar survey. 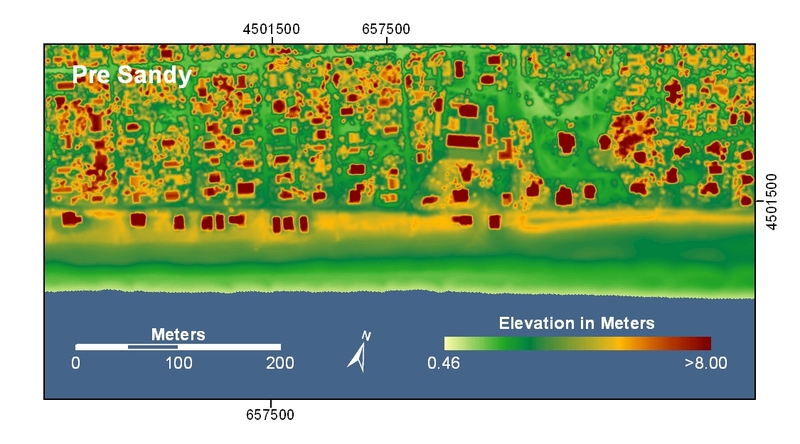 Below are pre-storm elevation maps, post-storm elevation maps, and elevation difference maps at each highlighted location. 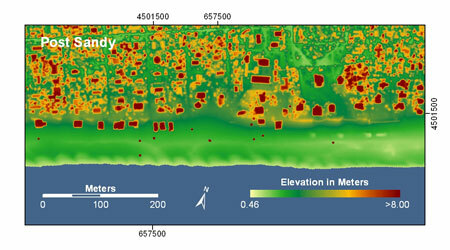 In the pre- and post-storm elevation maps, orange and red colors indicate higher elevations while yellow and green colors indicate lower elevations. 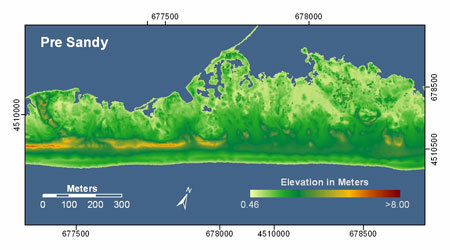 In the elevation difference maps, red colors indicate erosion such as shoreline retreat, and blue-green colors indicate accretion, such as overwash deposits where waves and surge have moved sand landward. 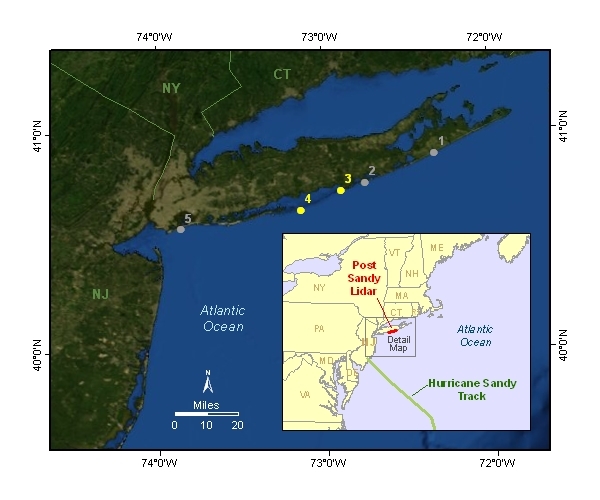 Location numbers are consistent with those from the photo pair comparison and maps are oriented with the Atlantic Ocean on the bottom.